CoderDojo is a global movement of free computer coding clubs for young people. The first Dojo was started six years ago. 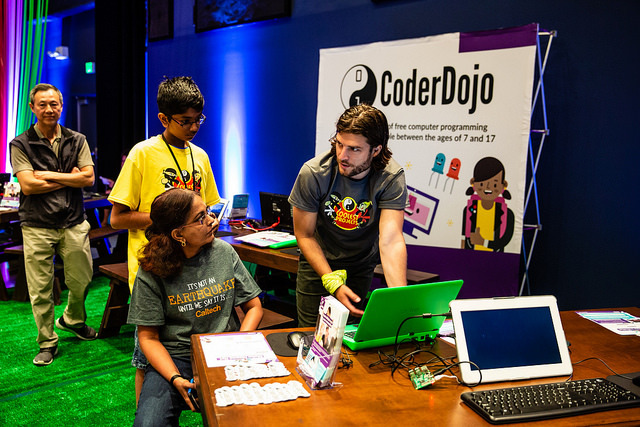 There are now more than 2000 active Dojos in 100 countries, giving 45000 young people the opportunity to learn how to code in a fun, social environment. The CoderDojo movement is supported by the CoderDojo Foundation, a registered charity. In October 2015 the Raspberry Pi Foundation merged with Code Club, followed in May 2017 by a second merger with the CoderDojo Foundation. Together we now represent one of the largest sustained global efforts to help young people learn about computing and digital making. You can read more about the our mission, values, and goals in our 2018–2020 strategy. We currently are looking for experienced and enthusiastic individuals for the below positions to join the North America team in Oakland. We are passionate about education and technology. If you are looking to have a real-world impact as part of a growing global movement, then this is the organisation for you. We are now looking for an organized and enthusiastic Club Program Coordinator to to join the growing Oakland-based Raspberry Pi Foundation North America team. The person taking on this role will be supporting the growth and engagement of our Code Club and CoderDojo programs in the United States. These are networks of volunteer-led after-school and out-of-school clubs that help young people aged 7 to 17 learn how to code and create with computers. You’ll manage communications with prospective and existing club leaders, and assist with campaigns to grow and retain clubs. You’ll report to the Club Engagement Manager and collaborate closely with other members of the global program teams to ensure that the vision for our programs is in agreement and that best practices are shared across teams. You’ll also contribute to the execution of Coolest Projects, a national showcase event for youth who create with technology. This role is a great opportunity for someone who is relatively new to this field and is looking for a place to grow professionally. See more and apply for the Club Program Coordinator position. We are also looking for a Club Growth Manager to to join the growing Oakland-based Raspberry Pi Foundation North America team. See more and apply for the Club Growth Manager position.